October 30, 2017 – Concentrations of carbon dioxide in the atmosphere surged at a record-breaking speed in 2016 to the highest level in 800 000 years, according to the World Meteorological Organization’s Greenhouse Gas Bulletin. The abrupt changes in the atmosphere witnessed in the past 70 years are without precedent. Rapidly increasing atmospheric levels of CO2 and other greenhouse gases have the potential to initiate unprecedented changes in climate systems, leading to “severe ecological and economic disruptions,” said the report. The annual bulletin is based on observations from the WMO Global Atmosphere Watch Programme. These observations help to track the changing levels of greenhouse gases and serve as an early warning system for changes in these key atmospheric drivers of climate change. Population growth, intensified agricultural practices, increases in land use and deforestation, industrialization and associated energy use from fossil fuel sources have all contributed to increases in concentrations of greenhouse gases in the atmosphere since the industrial era, beginning in 1750. Since 1990, there has been a 40% increase in total radiative forcing – the warming effect on our climate – by all long-lived greenhouse gases, and a 2.5% increase from 2015 to 2016 alone, according to figures from the US National Oceanic and Atmospheric Administration quoted in the bulletin. “CO2 remains in the atmosphere for hundreds of years and in the oceans for even longer. The laws of physics mean that we face a much hotter, more extreme climate in the future. There is currently no magic wand to remove this CO2 from the atmosphere,”said Mr Taalas. The last time the Earth experienced a comparable concentration of CO2 was 3-5 million years ago, the temperature was 2-3°C warmer and sea level was 10-20 meters higher than now. A separate Emissions Gap Report by UN Environment, to be released on 31 October, tracks the policy commitments made by countries to reduce greenhouse gas emissions and analyses how these policies will translate into emissions reductions through 2030, clearly outlining the emissions gap and what it would take to bridge it. “The numbers don’t lie. We are still emitting far too much and this needs to be reversed. The last few years have seen enormous uptake of renewable energy, but we must now redouble our efforts to ensure these new low-carbon technologies are able to thrive. We have many of the solutions already to address this challenge. What we need now is global political will and a new sense of urgency,” said Erik Solheim, head of UN Environment. Together, the Greenhouse Gas Bulletin and Emissions Gap Report provide a scientific base for decision-making at the UN climate change negotiations, which will be held from 7-17 November in Bonn, Germany. WMO, UN Environment and other partners are working towards an Integrated Global Greenhouse Gas Information System to provide information that can help nations to track the progress toward implementation of their national emission pledges, improve national emission reporting and inform additional mitigation actions. This system builds on the long-term experience of WMO in greenhouse gas instrumental measurements and atmospheric modelling. WMO is also striving to improve weather and climate services for the renewable energy sector and to support the Green Economy and sustainable development. To optimize the use of solar, wind and hydropower production, new types of weather, climate and hydrological services are needed. CO2 is by far the most important anthropogenic long-lived greenhouse gas. Globally averaged concentrations for CO2 reached 403.3 parts per million in 2016, up from 400.00 ppm in 2015. This record annual increase of 3.3 ppm was partly due to the strong 2015/2016 El Niño, which triggered droughts in tropical regions and reduced the capacity of “sinks” like forests, vegetation and the oceans to absorb CO2. 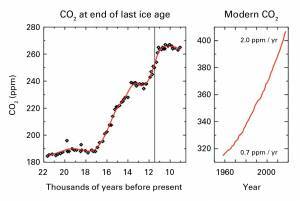 Concentrations of CO2 are now 145% of pre-industrial (before 1750) levels. The rate of increase of atmospheric CO2 over the past 70 years is nearly 100 times larger than that at the end of the last ice age. As far as direct and proxy observations can tell, such abrupt changes in the atmospheric levels of CO2 have never before been seen. Over the last 800 000 years, pre-industrial atmospheric CO2 content remained below 280 ppm, but it has now risen to the 2016 global average of 403.3 ppm. 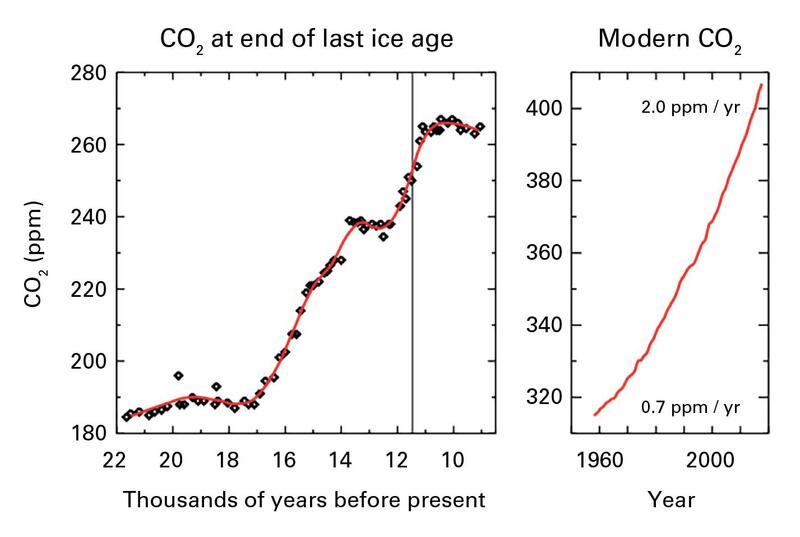 >From the most-recent high-resolution reconstructions from ice cores, it is possible to observe that changes in CO2 have never been as fast as in the past 150 years. The natural ice-age changes in CO2 have always preceded corresponding temperature changes. Geological records show that the current levels of CO2 correspond to an “equilibrium” climate last observed in the mid-Pliocene (3–5 million years ago), a climate that was 2–3 °C warmer, where the Greenland and West Antarctic ice sheets melted and even some of the East Antarctic ice was lost, leading to sea levels that were 10–20 m higher than those today. Methane (CH4) is the second most important long-lived greenhouse gas and contributes about 17% of radiative forcing. Approximately 40% of methane is emitted into the atmosphere by natural sources (e.g., wetlands and termites), and about 60% comes from human activities like cattle breeding, rice agriculture, fossil fuel exploitation, landfills and biomass burning. Atmospheric methane reached a new high of about 1 853 parts per billion (ppb) in 2016 and is now 257% of the pre-industrial level. Nitrous oxide (N2O) is emitted into the atmosphere from both natural (about 60%) and anthropogenic sources (approximately 40%), including oceans, soil, biomass burning, fertilizer use, and various industrial processes. Its atmospheric concentration in 2016 was 328.9 parts per billion. This is 122% of pre-industrial levels. It also plays an important role in the destruction of the stratospheric ozone layer which protects us from the harmful ultraviolet rays of the sun. It accounts for about 6% of radiative forcing by long-lived greenhouse gases.